Hi there, this is Phurba; guest blogger and the love-struck husband of Giselle. Anyone that knows me knows me to be very mellow and hard to excite or impress. However, today is one of those rare occasions. For a while now, we've been looking for the perfect art piece to complement our creative taste and fill the missing decorative gap in our living room. We've been visiting a lot of open studios and galleries during our free time but haven't been too inspired. 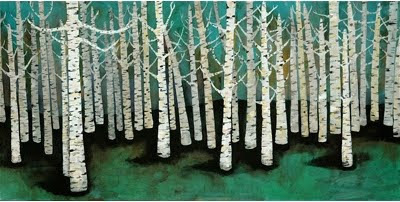 When Giselle finally showed me an image of Birch Forest Number 5 by one of her favorite local artists, Lisa Congdon, I initially didn't share the excitement she showed for it. It wasn't until today when Lisa came to our home and I got to see the piece up close and personal. I was so taken with the piece as it reflects my pining for natural things (in this case trees and the woods). The intricacy and creativeness pops off the canvas making the piece come to life. I can see why Giselle was so excited. Lisa's awesome. So taken were we that we commissioned her to do a larger piece for us. One that we wanted to personalize by making Momo, our precious little blind chihuahua mix, a part of the piece. We're so excited to see how it will come out and I'm sure that Giselle will put up pictures of it. Oh by the way, this is my first blog entry ever. If I get this excited again, I may be inspired to write a second one. Maybe when Apple finally switches to Verizon. lisa IS awesome. her sweetness is painted into everything she does. I get excited about her work, too! "Anyone that knows me knows me to be very mellow and hard to excite or impress." Not even one exclamation point. very cool artwork too.